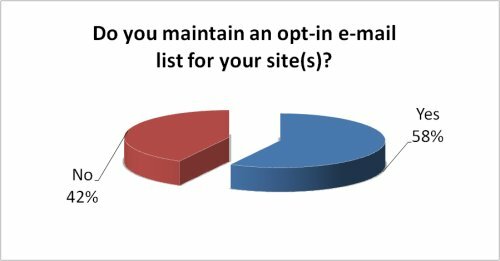 Affiliates were asked “Do you maintain an opt-in e-mail list for your site(s)?” for the 2011 Affiliate Summit AffStat Report. The majority of affiliates responded yes for this survey question. I am sort of surprised the percentage of affiliates with an email list is not higher. Email has been part of my affiliate strategy for as long as I can remember. In chapter five of Extra Money Answer, my free online book for getting started as an affiliate, I detail how I use email for my affiliate sites. More details on AffStat at http://affstat.com/.